Older listeners will recall that Mr James Marshall Hendrix once created a two-part symphonic poem which appeared on his gramophone recording Electric Ladyland. 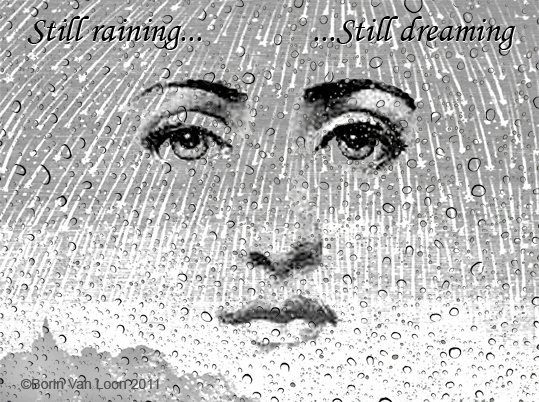 'Rainy day, dream away' was musically split asunder from its unidentical twin 'Still raining... still dreaming', like some latter day Scylla and Charybdis (for those of you with a public school education). Here is Borin's twenty-first century interpretation. The viewer is outside the window, looking in at a face inside. The meteor shower and hint of a landscape are reflected in the glass which bears the droplets resulting from precipitation.